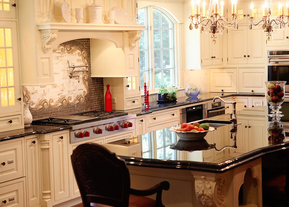 Apple Kitchens is a premier custom cabinetry design firm. We have been involved in more than one thousand kitchen projects over the 30 years that we have been in business. This vast experience is paralleled by few. From bathroom vanities to existing space kitchen remodeling, to large additions and new construction, we a well versed in all types of projects. Please contact us today so we may assist you with creating the kitchen or bathroom you have always dreamed of. Saturday from 10:00am to 3:00pm. Evenings and other hours by appointment. Our service area is large. We have been involved in projects as far as Florida and we do a significant amount of projects at the Jersey Shore and Pennsylvannia every year. Our core market of course is much more localized. It includes Moorestown, Haddonfield, Cherry Hill, Mount Laurel, Hainesport, Lumberton, Mount Holly, Medford, Medford Lakes, Tabernacle, Voorhees, Barrington, Haddon Heights, Haddon Township, Audubon, Collingswood, Pennsauken, Palmyra, Riverton, Delran, Cinnaminson, Riverside, Delanco, Edgewater Park, Burlington, and many more. Our Typical shore markets are Long Beach Island (LBI), Brigantine, Atlantic City, Ventnor, Margate, Longport, Ocean City, Strathmere, Sea Isle City, Avalon, Stone Harbor, Wildwood, and Cape May.